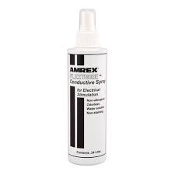 AMREX Flextrode Conductive Spray Item # W-AMX116 240ML Spray Bottle Provides uniform treatment for electrotherapy. Effective results without the mess of conductive gels or the grease of lotions. Comes in 240 mL spray bottle. Hypoallergenic.